"Sir, furst time Bundi? ", the bus conductor asked as we left the Kota Highway onto the deviation for Bundi. I nodded my head and he continued, "Bahot badhiya jagah hai, Sir. Verry butiful." I smiled and beamed inwardly. 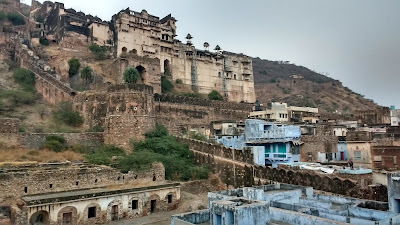 And sure enough, as we rounded the bend, the towering Taragarh fort and the city spread at its foot was truly a sight to behold. 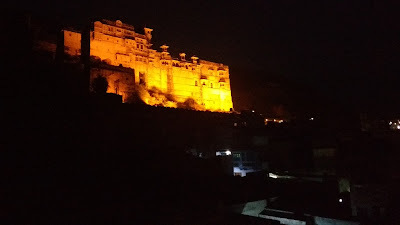 So, finally I was coming to Bundi, the founding city of the Hadoti region and the much revered land of step-wells, lakes and palaces vaguely mentioned in traveler forums. It was almost 5pm and the long day of traveling through the Mewar countryside was finally coming to an end. Yes, I was tired, but I had a lot to look forward to. 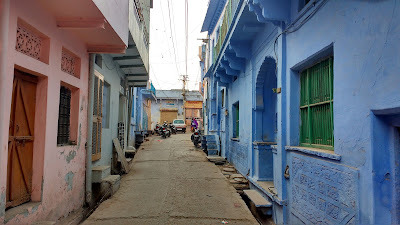 Bundi, in a broader sense, is like many old towns of India with narrow streets lined by short blue buildings on either side and electric cables looking like random lines that dissect the blue sky. 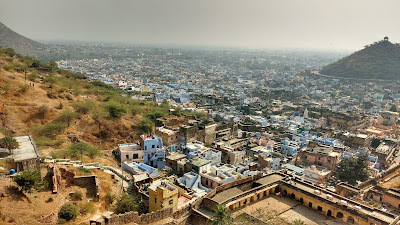 Much of Bundi's land is sort-of shaped like an open bowl with gently rising edges, until it steeply rises near the fort. Yes, there are people too, a lot of them and still more on festive times. Oh yes, I reached Bundi on 13th January - Makar Sankrant was on 15th, but the kite-flying would commence on 14th - so a festive season. 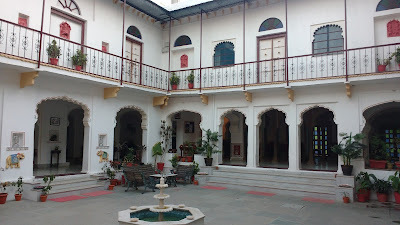 The best places to stay in Bundi are the havelis - old residences of the noblemen and merchants - revamped for the modern look. 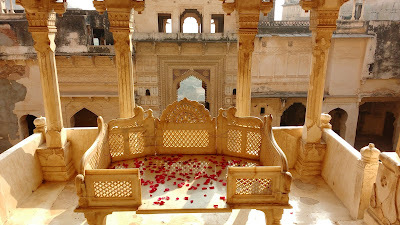 Bundi is dotted with such havelis and most of them do cater for the budget travelers. 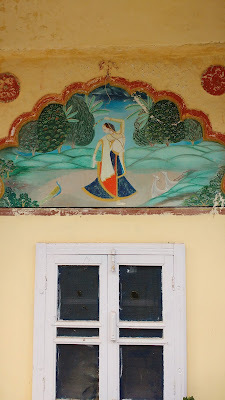 We checked into Dev Niwas and were positively flabbergasted with the place and the decor - whitewashed and art-deco walls, some antiques, old narrow staircases, wooden doors - and importantly, all within budget if shared. 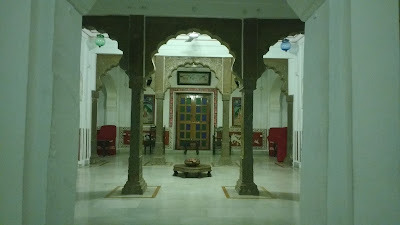 There's also Haveli Katkoun where we had our dinners. We had a butter chicken which was in no way a butter chicken, but was made so well that I can arguably call it among the best chicken dishes I've had while traveling. The huge palace of the fort dominates the north-western skyline of the city. The rest of the fort spreads out gently eastwards. 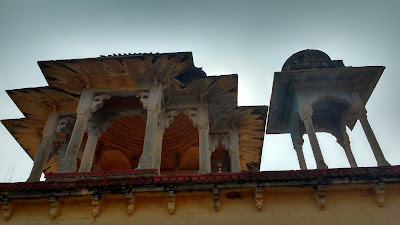 The palace was the seat of the Bundi royalty, but has been lying unused since 1911, as the owners (then subjects to the British) realized the futility of the maintenance expenses of what was now a single large house. The hike up to the palace and the fort starts near the old elephant stables - also converted to a hotel. The road steeply rises up to the ticket counter. 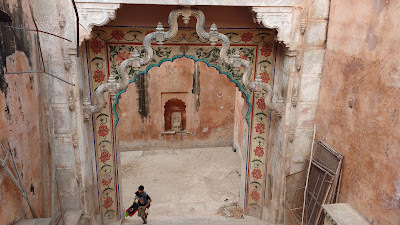 One then enters the palace through the Toran Pol. 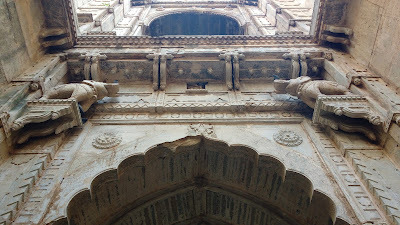 The palace, for most part is not well maintained, yet one can get a glimpse of the former beauty of the place - the old paintings, the marble jaalis, the old archways and the royal seat. 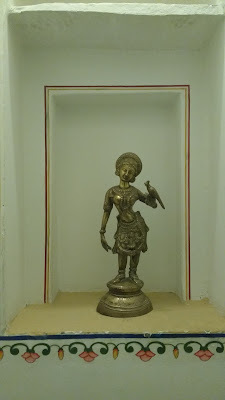 The main painting collection is in a locked room - called the Chitrashala. The attendant opens the room for the visitors only. The reason for this is the monkey infestation rampant in Bundi - more on that later. The fortress is a further 30 mins hike from the palace. The trail begins at a small gate where the watchman gave us sticks that may be used as protection against the monkeys. Glad I never had to use them. The fort has old ruins, step-wells and a massive bastion. A part of the fort is used as a wireless relay station by the Rajasthan Police. 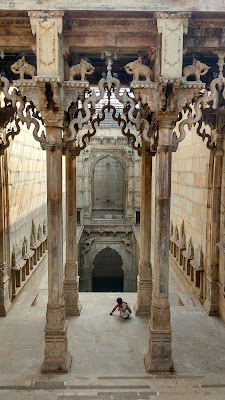 Bundi has quite a few step-wells - I have personally seen seven of them. The most famous one is the Raniji ki Baori with beautiful arches and sculptures. 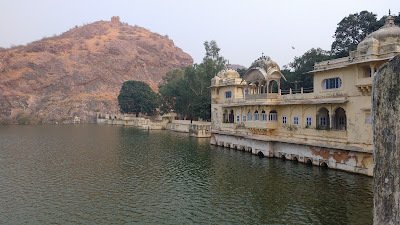 This is a small lake-side palace in Bundi by the Jait Sagar. Its claim to fame is that Rudyard Kipling stayed there for all his 2 days when he visited Bundi. I would, in any case, love to own a house like that. 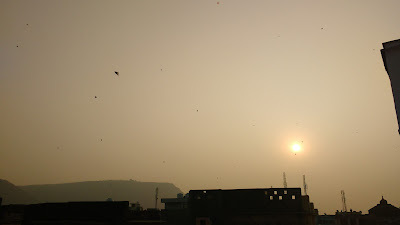 The entire city of Bundi was gripped in kite-flying frenzy on the 14th of January as colourful kites jostled for space in the foggy early morning sky, accompanied to seriously loud music. 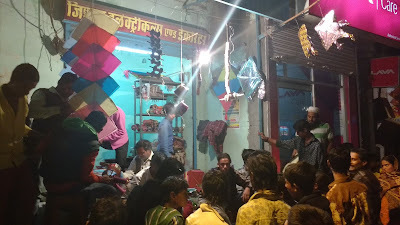 I, being just a beginner level flyer did not dare to have anything to do with the actual kites, but just helped with the manja (string) and the firki (spool). I did manage to mess up that too. 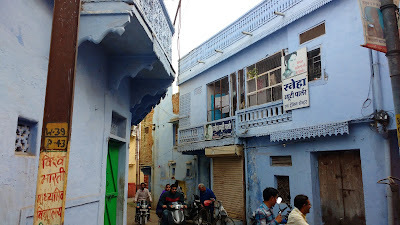 Bundi is best approached by road from Kota. 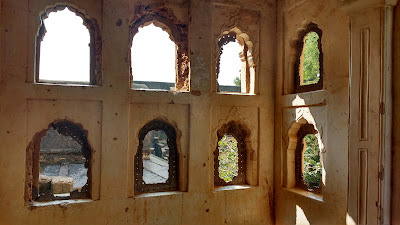 My itinerary, however, did not permit that, and so I ended up taking the 7:30 am direct bus from Udaipur to Bundi for an exhausting 10 hour ride. Bundi has rail links too, but trains are not that frequent. Connections to Kota, Jaipur, Chittaurgarh and Udaipur are available. 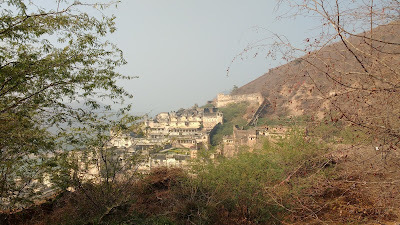 The tourist scene in Bundi is very much dominated by foreigners. Indian tourists are mostly the day-trippers from Kota. Consequently, the food heavily caters to the western palate. Signboards in Hebrew and French were common. There's also a flourishing miniature-painting business here where they paint Mughal style miniature paintings on backs of old post-cards - worth a look. Thanks for sharing this article. I never knew a place like Bundi existed before. Would love to visit it one day.